Two grinches spoiled Christmas Day for a New York City church, robbing the safe of more than $20,000 in donations for needy children, police said. "I think it's pretty pathetic that somebody has a nerve to rob a church on Christmas," parishioner Mark Regusa told WCBS-TV's Reid Lamberty. The pastor at St. Mel's Roman Catholic Church in Queens said he believed the two men knew where they were going when they broke in through the back door and stole between $20,000 and $30,000 after morning Mass. "It was done while the people were in the building," the Rev. Christopher J. Turczany said. "I think that's really low, especially this time of year, to take advantage of situation where people are walking in and out of church," said parishioner Rudy Serpa. 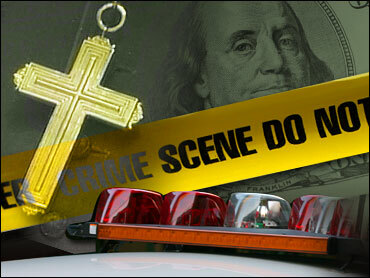 When church employees left the back area where the safe was located, the money box was removed from the safe, he said. A parishioner saw the crooks flee with the cash in a sports utility vehicle. No arrests had been made as of Monday evening. "I couldn't think of anyone who would do this, especially rob a church, especially on Christmas Day," said the parishioner, Christopher Urena. "I don't wish them any harm. I just want justice so that no one else gets hurt, no other parish gets robbed and no one should be able to get away with that," said Turczany. The money represents collections from about four masses, reports Lamberty, but there is a silver lining: Most of that money was in the form of checks.